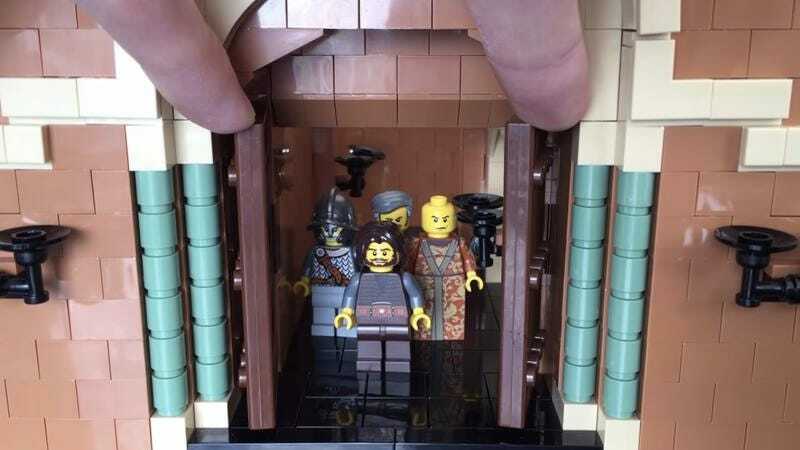 We’re probably still a decade or so away from The Lego Game Of Thrones Movie, but one enterprising fan already has a head start. YouTube user Tusserte has spent the last year and a half painstakingly recreating the HBO series’ Red Keep throne room from more than 15,000 Lego pieces. Somebody pour this guy a chalice of Dornish sour red. What’s especially impressive about the creation is how it can be reconfigured to reflect the throne room across multiple seasons. When Joffrey takes over at the beginning of season two, for example, he swaps out the vine-roped columns of his predecessor with a more fearsome design. There’s also a variety of stained glass windows that, to reflect the Lannister flourishes of the latter seasons, can be replaced with the house’s lion crest, which, thanks to its Lego-ian nature, is perversely adorable. Tusserte promises that his creation will continue to evolve based on the events of the forthcoming seventh season. With Daenerys heading that way, dude better got some dragon Legos ready.